Although manatees look more like beluga whales than elephants, manatees and elephants have similar features. Both creatures are mammals. They also have hard grey skin and "toe" nails—elephants on their feet, but manatees on their flippers. Manatees live to be 40 to 60 years old. Like elephants, manatees also grow to be very large: they can weigh 800 to 3,000 pounds. These marine animals are gentle giants and don’t attack humans. Some manatees live in saltwater and others in freshwater. 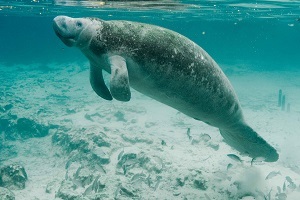 Many manatees live in rivers, saltwater territory, and coastal areas. They also live in the Gulf of Mexico, the Caribbean Sea, the Amazon Basin, and in East Africa. There are five kinds of manatees, each named after where they live: West Indian, West African, South American, Antillean, and Floridian. When a baby manatee is born, it is called a calf. Calves only live with their mothers for two years. Female manatees can be pregnant for a year, and they only have one calf at a time. When a baby is born, the mother holds it up to the surface of the water so it can breathe. Manatees use their flippers for eating and steering underwater. They are herbivores that primarily eat plants. Sometimes, they also eat fish. They can eat up to 100 pounds of food each day. Manatees swim to the surface to get air every three to four minutes, but they can hold their breath for 20 minutes. They typically like to be alone, but sometimes they like to play with other manatees, with whom they communicate by making loud clicking noises. Gentle and kind, manatees have adapted well to their marine environments.